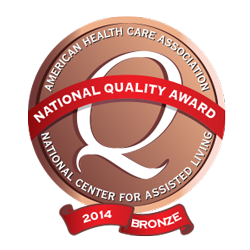 CLEARWATER, Fla., June 16, 2014 — Westchester Gardens Rehabilitation Care Center has been recognized as a 2014 recipient of the Bronze – Commitment to Quality National Quality Award for its outstanding performance in the health care profession. The award, presented by the American Health Care Association and National Center for Assisted Living (AHCA/NCAL), highlights facilities across the nation that have demonstrated their intention to pursue a rigorous quality improvement system. The program has three levels: Bronze, Silver, and Gold. Facilities begin the quality improvement process at the Bronze level, where they develop an organizational profile with essential performance elements such as vision and mission statements and an assessment of customers’ expectations. Bronze applicants must demonstrate their ability to implement a performance improvement system. A team of trained Examiners reviews each Bronze application to determine if the facility has met the demands of the criteria. As a recipient of the Bronze – Commitment to Quality award, Westchester Gardens Rehabilitation Care Center may now move forward in developing approaches and achieving performance levels that meet the criteria required for the Silver – Achievement in Quality award. The awards are sponsored by AHCA/NCAL Associate Business Member My InnerView, a web-based applied research and quality-management company that supports leaders across the entire assisted living, senior housing and skilled nursing profession with tools to measure, benchmark and improve performance. Westchester Gardens Rehabilitation Care Center was one of thirty-one Florida facilities to receive the Bronze level award. The recipient centers will be honored during the AHCA/NCAL’s 65th Annual Convention and Exposition, October 5-8, 2014, in Washington, D.C.